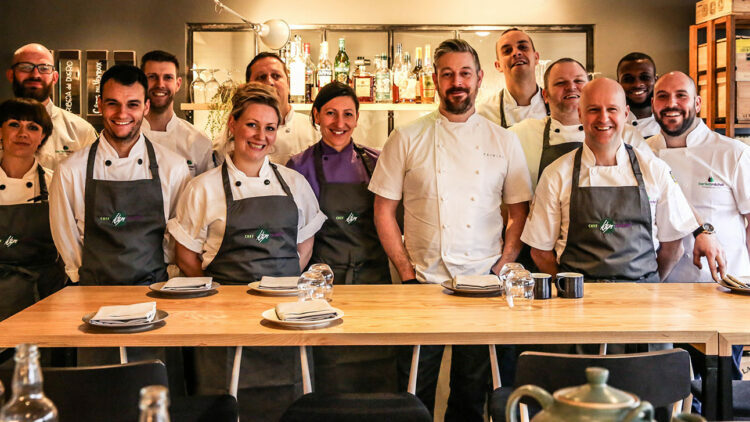 We have an exclusive partnership with Michelin starred chef-consultant, Adam Byatt. His reputation for ingredients that are both thoughtfully sourced and British in origin makes him a perfect partner for bartlett mitchell. Adam Byatt’s role as our chef consultant is to share his expertise while working alongside Executive Chef, Pete Redman, and our chef brigades. Adam Byatt hosts client master-classes, advises on sustainable sourcing and creates signature dishes for our client restaurants. Adam Byatt and bartlett mitchell from bartlett mitchell on Vimeo. Adam Byatt is the chef-patron of three Clapham-based restaurants: Trinity, Bistro Union, and Upstairs. Adam Byatt, was awarded a Michelin Star for Trinity and a Bib Gourmand for Upstairs in the prestigious Michelin Guide 2017. Adam said “It is such an honour to see that the hospitality we have been offering at Trinity has been endorsed by the Michelin guide. When you cook for a living and your work is recognised in this way by the most trusted food guide in the world, you can’t help but feel a sense of confidence in what you’re doing and a desire to push forward”. Since its opening in 2006, Trinity has been the recipient of ‘Time Out’ best new restaurant, and the AA’s prestigious ‘London Restaurant of the Year’, as well as having held three AA rosettes for four years. It was voted in the top ten restaurants in London by both Hardens and Zagat, and has been listed in The Times Top 100 Restaurants in the UK. In The Times, Giles Coren declared it, “as close to an absolutely perfect experience of eating out as it is possible to have”. Adam has appeared on TV shows including Saturday Kitchen and Celebrity Masterchef. You can see some of Adam Byatt’s recipes here.